Visual AIDS invites curators to submit proposals for their annual one-month exhibition, to take place summer 2020. Visual AIDS utilizes art to fight AIDS by provoking dialogue, supporting HIV+ artists, and preserving a legacy, because AIDS is not over. Visual AIDS will provide up to a $15,000 exhibition budget, an exhibition venue in NYC, a $2,000 honorarium per curator, and administrative support, along with connection to Visual AIDS artist members and information about HIV/AIDS and related contemporary issues. Read more about this opportunity and submit your proposal by Monday, April 22! 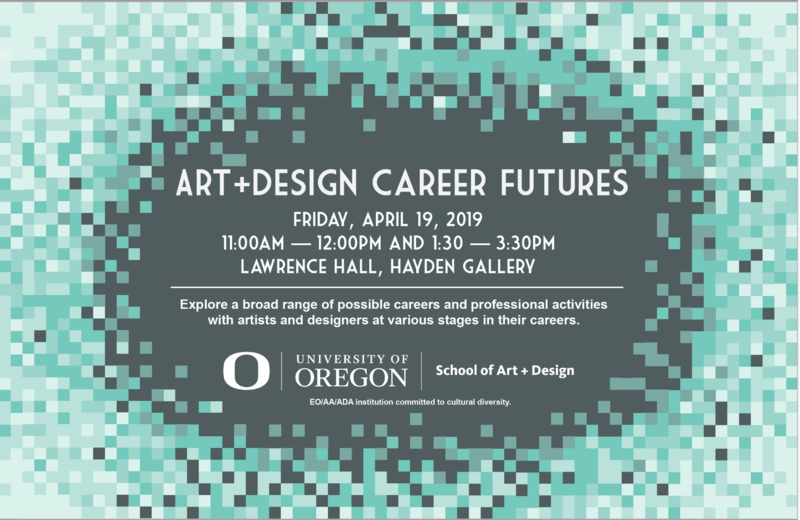 This message is being posted because it may be of interest to University of Oregon art students. Neither the UO nor the Department of Art make any representations or endorsements regarding the content of the message or its originator. Any questions or comments about the message should be directed to the originator of the message and not to the Department of Art. LOCAL 14 Education Foundation is pleased to offer this scholarship to dedicated students in fine art programs. A reminder of the upcoming deadline on Saturday May 11th, 2017, and hope to see as many students participate as possible. Thanks! We are looking forward to seeing and rewarding this year’s talent! My colleagues at TriMet are hiring a public art intern. Great opportunity for someone who wants to be in Portland this summer! Registration is open for the 2019 UO Mental Health Summit! As part of programming for National Mental Health Month, a day-long Mental Health Summit is being planned for UO undergraduate and graduate students and faculty and staff. The Summit will take place on Sunday, May 5 from 10:00 a.m.-4:30 p.m. in the EMU. Light breakfast and lunch will be provided. 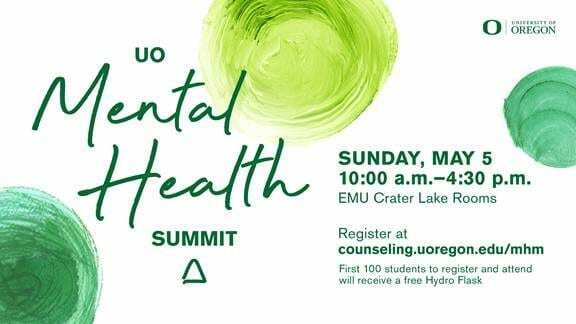 This event is free of charge to UO students, faculty, and staff The first 100 students to register and attend the Summit with receive a free Hydro Flask. Registration deadline is Friday, April 26. 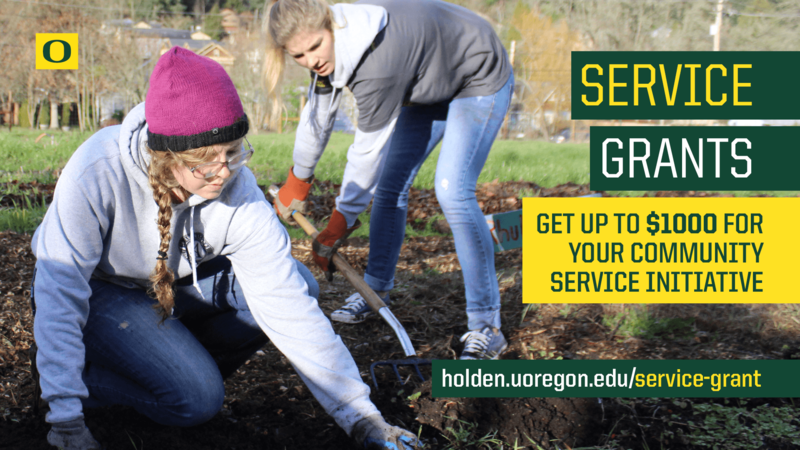 Want to make your service project a reality? 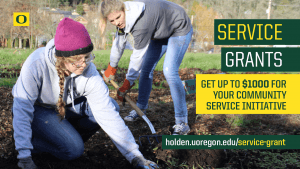 Apply for a Service Grant through the Holden Center. Earn up to $1000 for you or your student organization to design and implement a project that collaborates with an off-campus organization to positively impact the community. Applications are open now and will be accepted until May 17th, 2019. Recipients will be notified of award decisions within one month of their application submission. I’m reaching out to share an upcoming creative community event with you. 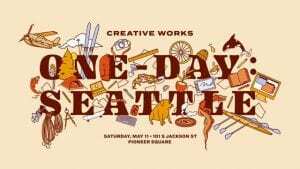 It’s called Creative Works One-Day and is designed to connect, inspire and empower a united creative community. 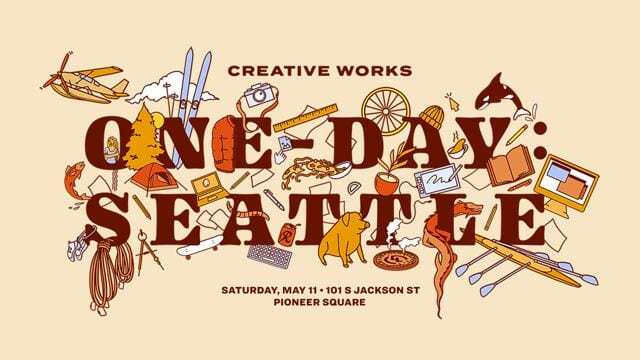 One-Day is a micro conference that consists of 9 talks, 12 market vendors and a dinner. The lineup includes: Ash Huang of Adobe, Cameron Campbell of Amazon, Mina Markham of Slack and many more leaders in the design community. We’re in our 6th year of conference experiences and I’m excited to bring this to the PNW. I used to live there years ago. General admission is $199 and student admission is $149. We had a great first day of the HOPES  sustainability and design conference! We are so excited about the conversations that have been generated by yesterday’s activities. Let’s maintain that momentum! For those of you planning to attend Earl Mark’s workshop at 1pm, please remember that part of the workshop will be outside so wear appropriate clothing and shoes. In the fleeting moments setting up rapid shelter following a catastrophic event, speed may be critical and site data unavailable. With Associate Professor of Architecture, Dr. Earl Mark, and Marine Biologist, Dr. Deborah Brosnan, participants equipped with compass, camera* and sketchpad walk the southern bank of the Willamette River adjacent to UO. Recording what is directly observable, they will then move indoors to layout shelters with a minimal environmental footprint from prepared paper fold models. The experiment concludes with a discussion of lessons learned. Randy Hester’s lecture, “Design for Ecological Democracy” will start at 10:30, (not as listed on the brochures at 10). For more information about the HOPES Conference, follow the link below. All events are free and open to the public. Little Traverse Bay Bands of Odawa Indians is hiring an archivist to maintain records, materials, artifacts, locating and collecting new materials, create and maintain an accessible computer database incorporating the newest technologies available, providing research assistance for users, authenticate historical records and items, copy materials to video, audio and computer formats as necessary and to maintain the integrity of existing collection utilizing the appropriate archival methods and care for collections. Indigenous/Native preference will apply. See eligibility requirements and apply by Wednesday, April 17! Welcome to Your Enlightened Side! 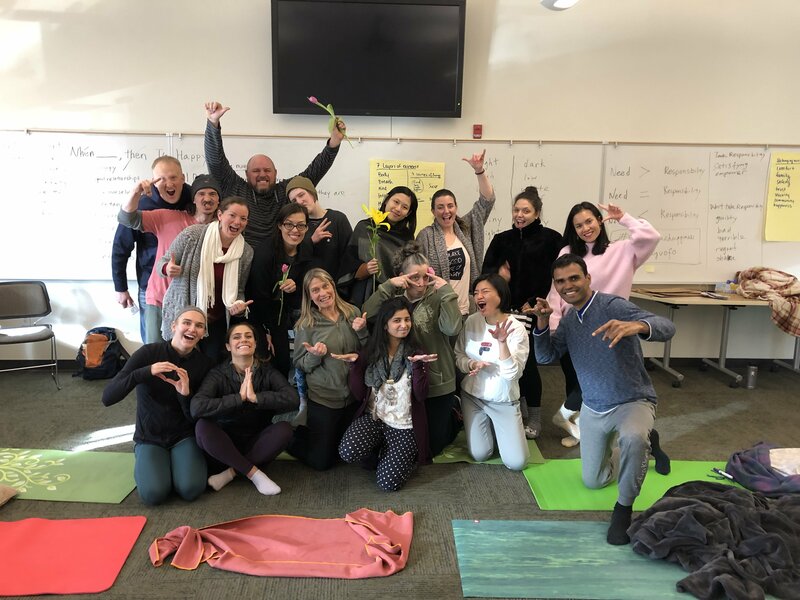 We invite you to join us for the SKY Happiness Retreat at the University of Oregon from April 19 – 21! INTERESTED? Click on the brown button below and answer just a few questions to apply for a student scholarship in order to attend the Retreat for only $75. Once your scholarship application has been accepted, we will notify you to register. Availability is first come, first serve. Retreat attendance to ALL sessions is mandatory. Faculty/staff & family/friends are welcome to attend the Retreat as well. 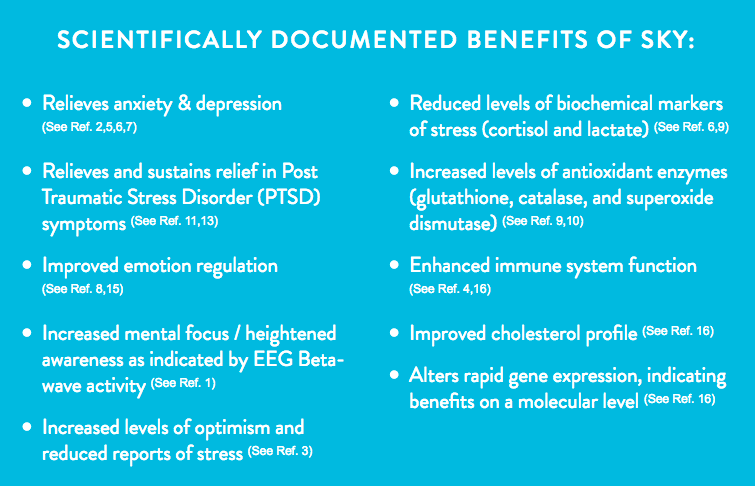 So what exactly is the SKY Happiness Retreat? 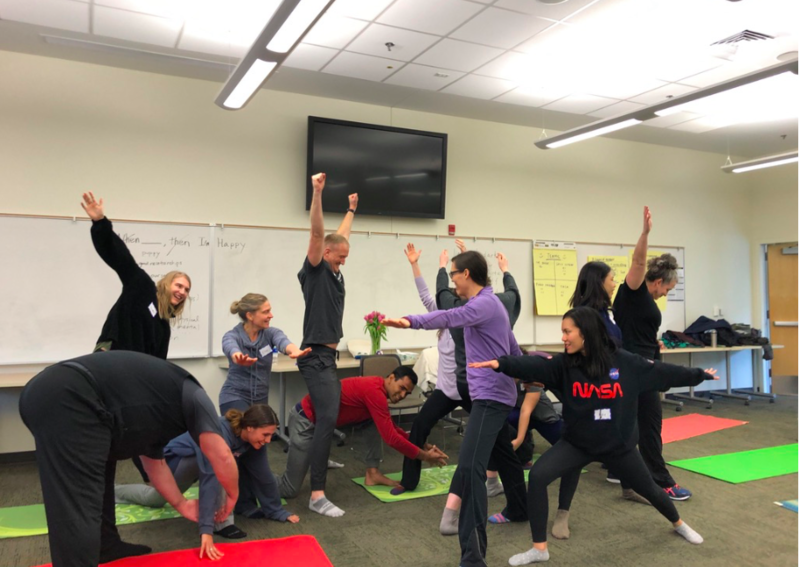 Taught over three consecutive days, we introduce the SKY meditation technique, a scientifically validated breathing practice that significantly increases one’s well-being and calmness. 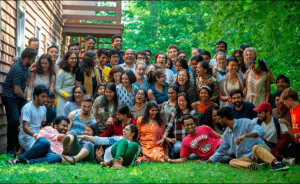 The SKY Happiness Retreat is one of the coolest places to connect with yourself, make awesome friends, and have FUN! Below are photos from our previous workshops, benefits of SKY meditation, and testimonials. will be happy to pay them for it. Deadline: Monday, May 20, 2019, 5 p.m. 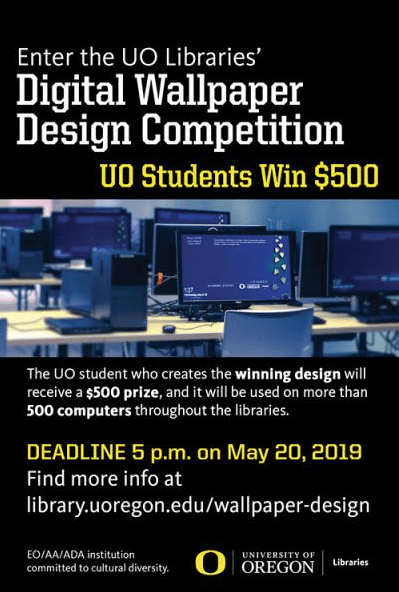 The UO Libraries is pleased to announce our annual contest to design new digital wallpaper for the library’s workstations. The winning design will be used on more than 500 computers throughout the libraries. The creator of the winning design will receive a $500 prize. 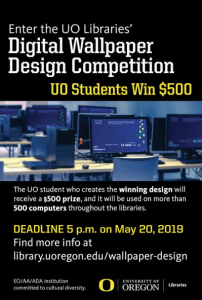 The digital design contest is open to all current UO students. 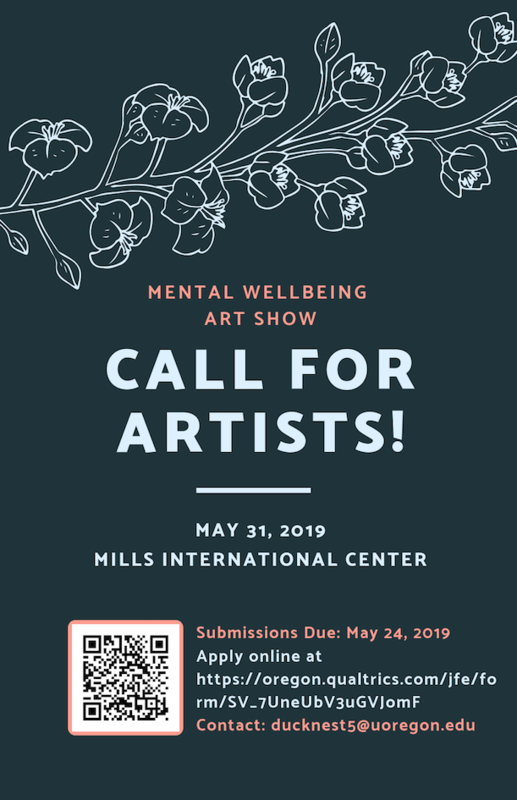 Deadline for submissions is 5 p.m. on Monday, May 20, 2019. Multiple entries per student may be submitted. 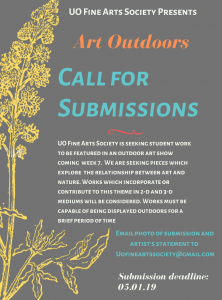 Send an email message to libsys@uoregon.edu, with your name, current UO affiliation, a brief description of the piece, and preview of the image as an attached jpeg, with a resolution of 1680×1050. In the message, please include instructions on how to download, or otherwise obtain, the full Photoshop or Illustrator file, whether through Dropbox, ftp, website, etc. ORIGINALITY: The design must be completely original and contain no copyrighted material. Entries will be judged by a committee of students, a faculty member, and library staff. For currently enrolled students, awards are given as scholarships, with $500 applied directly to the UO billing account. If the recipient has already graduated, the award is given as a cash prize. Winner retains copyright to their original work and grants UO Libraries nonexclusive rights to publish the work to UO Libraries workstation monitors, UO Libraries digital bulletin board system, UO Libraries social media channels, UO Libraries digital and print publications. Save a copy of the work as .jpg file to attach in your submission email message. The wallpaper’s 1″ margins on the left, right, and bottom may be obscured by the operating system. The text and general location must remain the same. Font size, font family, color, and other stylistic elements may be adjusted to suit the artwork. The image, not including text, should be low-contrast so icons show up clearly. There must be space for a logout button icon to be placed in the top left corner. Also: A variant image with a visibly different layout or color scheme, with the Top Right “Authorized use only” text replaced by Top Right “Internet Kiosk” text. Also: Please familiarize yourself with theUniveristys logo system, to ensure it falls within the guidelines. Come by our pop up – front lobby of Lawrence Hall. Please join us until 3:30 today to select your bowl and be part of the Ocean Bowl Project. Join artists/designers to support our beloved Pacific Ocean. We generated a site-specific art experience with ocean-inspired ceramic bowls, then temporarily harbored debris that washed onto the beach inside the Ocean Bowls. The poetic gesture of removing debris and cleaning the bowls is an act to restore local habitat and benefit all beings who call the Pacific Ocean home. 100% of proceeds go to the Cape Perpetua Marine Reserve. My name is Meaghan and I work with a local organization called StoveTeam International. We are based here in Eugene but work in Central America promoting the local production of fuel-efficient cookstoves. You can learn more about our work at www.stoveteam.org. I am reaching out to see if there are any students in the art department who may be interested in helping us with a small art project. Our program manager is developing a few materials to teach local children in Copan Ruinas, Honduras about the dangers of open fires. He is in need of a volunteer that has drawing/animation skills. It would be a short-term project that we would like to complete as soon as possible. Promoting the local production of safe, affordable, and fuel-efficient cookstoves in the developing world. 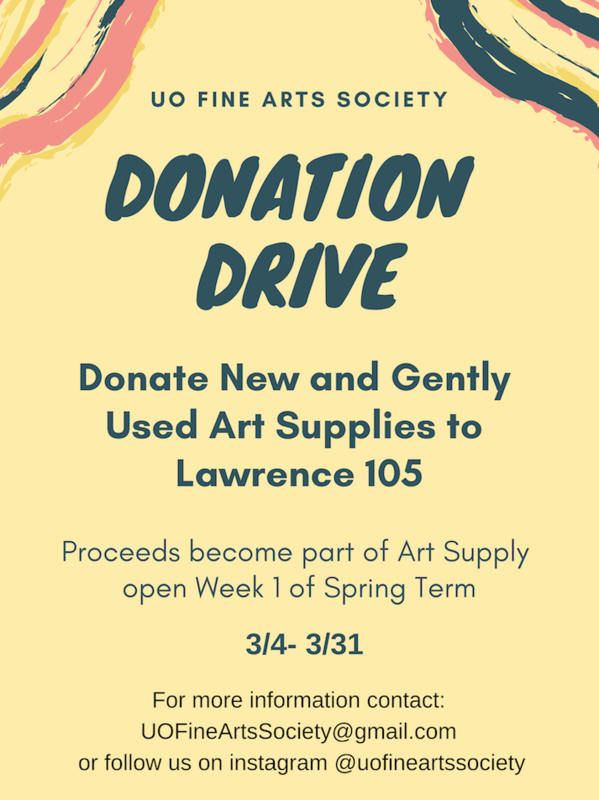 The Art Supply Pantry is a student- run art supply resource which provides free used and new art supplies to College of Design students. My name is Aleksandra Bogunovic and I am the CEO of Aerothreads, Inc. Aerothreads a small business located in College Park, Maryland that specializes in the custom design, manufacturing and installation of Multi-Layer Insulation (MLI) blankets for test and flight space hardware. We are currently looking to hire for our summer internship program, which is paid and starts 6/3/19. Aerothreads is Woman-Owned Small Business (WOSB) and SBA certified HUBZone Small Business that specializes in the design, fabrication and installation of Multi-Layer Insulation (MLI) blankets. Our job is to design and fabricate custom MLI blankets that protect spacecraft hardware from the harsh environment of space. We are made up of makers, artists and engineers, most of whom have a background in textiles, fibers, fashion, or costume design. We believe that our success is attributed to the creativity and skill of our team members who bring their experience into the space industry. Provided with customer CAD drawings or hardware, we create our templates by draping or drafting. Once theses templates are checked for fit and function, they are used to fabricate MLI blankets into 3D shapes. These MLI blankets undergo many levels of testing to ensure that they satisfy mission requirements. Upon completion of testing we install the blankets onto the space ready hardware. We take pride in our emphasis on quality and attention to detail as every stitch, fold and tape is mission critical. As a Thermal Blanket Intern, you will learn the basics of MLI blanket design, fabrication, and installation. Innovation and craftsmanship are the core of our business and something we look for in our team. Individuals who have strong patterning skills, like to work in teams and solve unique problems are well suited for this position. The MacDowell Colony and The Ford Family Foundation are working together to provide residencies to Oregon’s visual artists. MacDowell provides valuable work time as well as inspiring environment in which creative artists are provided with exclusive use of a studio, accommodations, and three prepared meals a day for two weeks to two months. The Ford Family Foundation is dedicated to enhancing the quality of artistic endeavor by Oregon’s established visual artists through the Foundation’s Visual Arts Program. We hope you will consider applying for this opportunity. The attached document outlines the partnership in further detail. There is no cost for a Fellowship; however, artists are responsible for their own materials and travel expenses. In order to open the residency experience to a broader community of artists, MacDowell offers two financial assistance programs to those who have been awarded a Fellowship. Need-based stipends are available to artists who would not otherwise be able to afford the time away that a Fellowship requires and travel reimbursement grants are available to defray the cost of travel to and from New Hampshire. Our next deadline is April 15, 2019 for the fall 2019 residency season at MacDowell. For questions, contact the admissions department at admissions@macdowellcolony.org or 603-924-3886 ext. 113. I am reaching out because we are in need of an art student to complete a small task of us. Our program manager is developing a few materials to teach local children in Copan Ruinas, Honduras about the dangers of open fires. He is in need of a volunteer that has drawing/animation skills. It would be a short-term project that we would like to complete as soon as possible. It could be a great task over spring break. If a student is interested, they can email mike@stoveteam.org. Call to Sculptors deadline 4/11! Up to six artists will be chosen by the Public Art Committee to display sculptures around the exterior of City Hall. The exhibition period is July 2019 through June 2021. 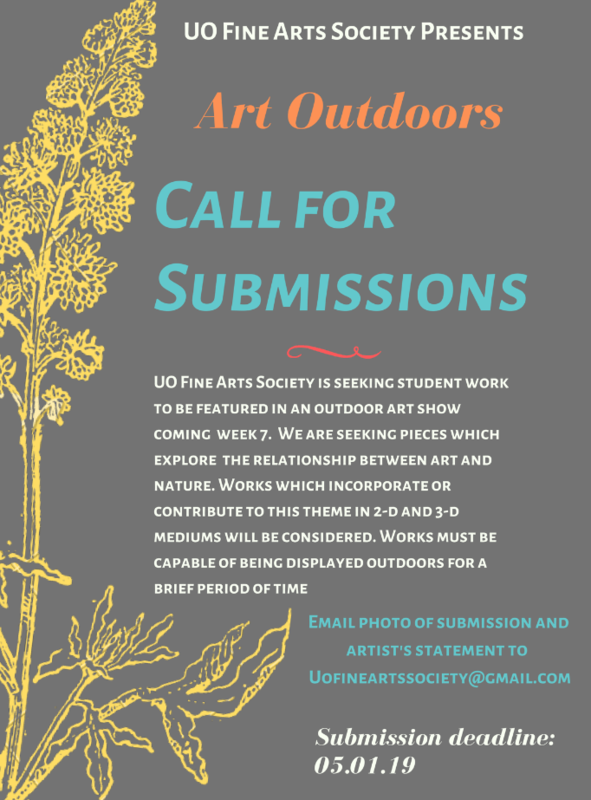 Submissions may include proposed, partially or fully completed sculptures. 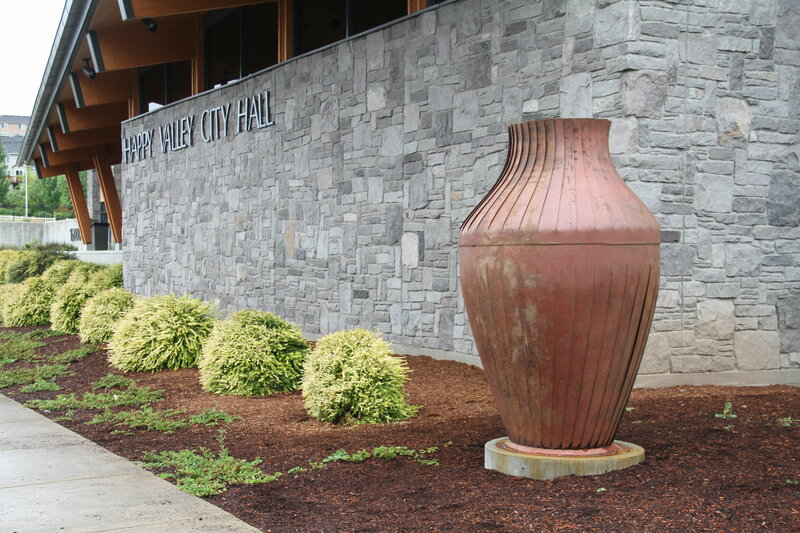 The city will provide each selected artist a $750 honorarium per sculpture. I’m writing with an exciting opportunity for students at University of Oregon to showcase their work to wider audiences, further their involvement in the film world, develop critical thinking and enhance their creative practice. Submissions are currently open for the BAFTA-Qualifying Aesthetica Short Film Festival (ASFF). We are looking for students, who are pushing the boundaries of filmmaking forward, to participate in the 2019 event. Students can submit their Short Films, Feature Films or VR & 360 works for consideration. ASFF also accepts works across multiple genres including: Animation, Comedy, Documentary, Drama, Fashion, Music Video, Thriller and more. Entries close 31 May. Students are a huge part of what makes ASFF so enriching and successful, with opportunities to develop critical thinking and creative practice. We’re offering educational institutions the chance to Save 25% on submissions when entering 10 or more films. Costs per entry: Shorts £18 | Features £33.75 | VR Projects £22.50. Offer ends 5 April. Please contact me for further details or to request an invoice CLICK HERE. If you have any questions about the festival, please feel free to get in touch. I am reaching out to see if there are any students in the art department who may be interested in helping us with a small art project. Our program manager is developing a few materials to teach local children in Copan Ruinas, Honduras about the dangers of open fires. He is in need of a volunteer that has drawing/animation skills. It would be a short-term project that we would like to complete as soon as possible. It could be a great task over spring break. I work for a Eugene-based manufacturer of archery equipment called Bowtech. We’re a premium consumer brand and manufacture our products in our factory here in Eugene. This Fall we’re launching several new products, including a new line of carbon fiber bows. We really want to emphasize the lightness and technology of these new products, and believe that color is a great way to do so. The archery category tends to be very traditional, with a limited and bland color pallet. We want to try something different. This new line of bows will appeal to a diverse audience, by age, gender and archery experience. If interested, develop other decoration options, including camouflage patterns, carbon fiber finishes, etc. I believe this is an interesting project for a student. Must have Work Study Funds to qualify! To apply, please visit Heidi Howes in the Art Office in Lawrence Hall, Rm 254, between 1:00-3:30pm on weekdays. The Center for Translational Neuroscience (ctn.uoregon.edu) is looking for a graphic designer to work on an hourly basis to create communications materials such as event flyers and website content. 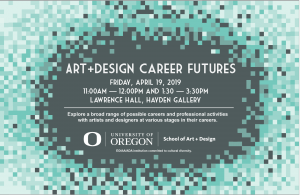 Send a resume and portfolio to Lisa May at lmay@uoregon.edu. Work study is a bonus! SPRING BREAK : Need to Make Some Cash? I am looking for 2 individuals seeking work over Spring Break – this will be outdoor labor clearing blackberries and fallen trees. Dates to be determined by weather and availability. 10 – 15 hours and earn between $12-$14/hr depending upon skills. This is physical work and you must have the ability to lift, dig and haul. If you have power tools pay is negotiated higher. This Thursday’s Triple Art Receptions at UO! The workshop registration fee is $20. Earn more than $7,000 in one summer. Our full-time teachers typically earn $500-$700 per week. Community Arts Grants — Info Session March 6th! 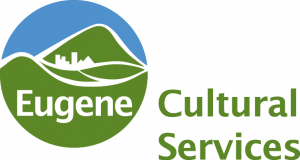 EUGENE, Ore.— Funded by the City of Eugene and administered by Lane Arts Council, the Community Arts Grant program creates opportunities for Eugene artists, and ensures diverse, accessible arts experiences for Eugene participants and audiences. The grant program supports the ever-expanding role of that arts in the cultural, social, educational and economic areas of community life in Eugene. Guidelines for both grants have been revised for this year. Through these changes, the City of Eugene and Lane Arts Council hope to increase the impact of grant funding by encouraging strategic organizational, program, and audience development. The overall goal is to support the long-term viability and success of Eugene’s arts community. 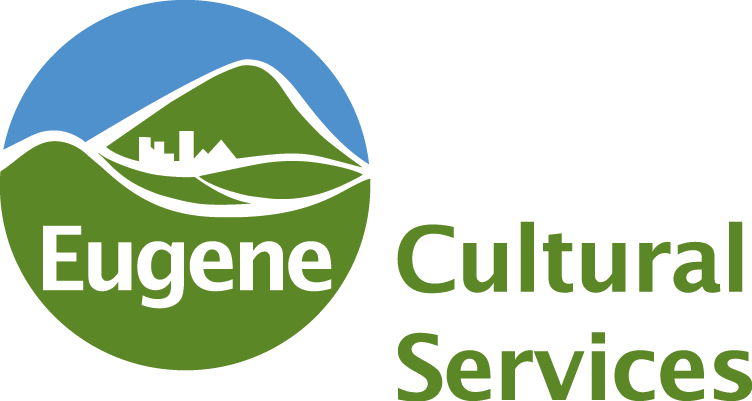 The Community Arts Program Grant provides two-year operating support to Eugene’s mid-sized community arts organizations. The primary goal of the Program Grant is to help arts organizations fulfill their strategic goals and reach the next level of their development such as capacity building, program development, audience building, staffing, expanded partnerships, and other organizational advancement. This is a competitive grant awarded every two years for up to seven arts organizations in Eugene. 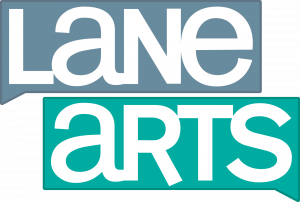 Lane Arts Council will award $5,000 each year for two consecutive years. The Community Arts Project Grant prioritizes projects that emphasize accessibility to underserved audiences and provide arts programming that takes place in the City of Eugene. Competitive project proposals demonstrate strategies for community impact and provide access and inclusion to underserved and underrepresented communities whose opportunities to experience the arts are limited by ethnicity, economics, or disability. Proposals might include exhibits, performances, festivals, workshops, events, programs and other examples of arts and culture projects. 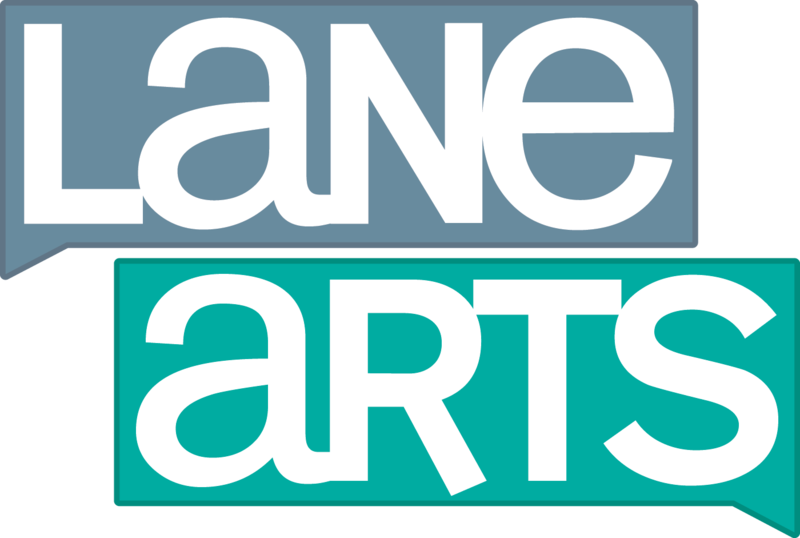 Visit http://lanearts.org/community-arts-grants/ for guidelines and applications. Taleamor Park is especially seeking applications from visual artists for two-week residencies between May 11 and September 28. 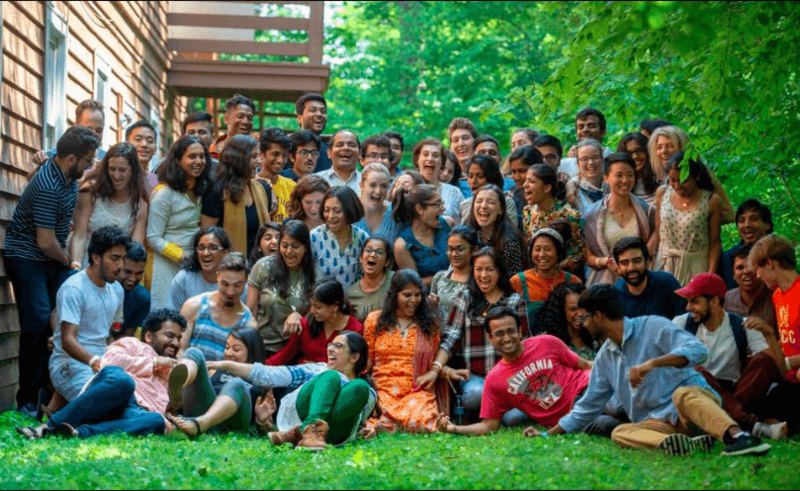 For each of the six sessions we offer one $750 MacKenzie Fellowship, coupled with an assistantship that covers the residency fee in exchange for 12 to 15 hours work per week. Others will pay according to a tiered pricing structure. We strive to maintain a balance between writers and visual artists, but most of our applications so far have been from writers. So please encourage visual artists to apply for this rewarding opportunity. Acceptance is moderately but not extremely competitive, so we encourage anyone with strong work, references, and commitment to apply, especially if their project can relate to the unique qualities of our scenic rural location near Chicago and Lake Michigan. Residents live in a lovely 1854 Italianate farmhouse that has four private air-conditioned bedrooms, two bathrooms, two kitchens, a laundry room, two common rooms, a library, a writing nook, and a paper studio. Vintage outbuildings offer both private and spacious shared studio spaces. Verdant walking trails wind from the native plant and vegetable gardens, on through fields of grain, and further to woods and ponds and scenic vistas. Taleamor Park borders the mid-continental divide, from which waters flow either to the Gulf of Mexico or to Lake Michigan and the Atlantic. Taleamor Park especially encourages residents who will respond to its unique location for site-specific installations, eco-artistic projects, parkland design and construction, plant growing and care, meditative walking, issues of water supply and quality, creative solitude, and plein air as well as studio painting. There is a downloadable application form, and applications for the residency are accepted as long as places are open. Applications for MacKenzie Fellowships with an assistantship are due March 12. Announcing the 2019 Plastics Innovation Challenge! Launched in 2012, the Think Beyond Plastic Annual Innovation Challenge seeks to inspire the human spirit to raise global #innovation and for upstream innovations in new materials, green chemistry and new product delivery models. Each year, it attracts a growing global audience of #entrepreneurs, #innovators, #scientists and #students, committed to viable solutions to plastic pollution. The 2019 Plastics Innovation Challenge, in partnership with The Klosters Forum, aims to engage innovators around the world in a #solutions-oriented effort to stem the flow of plastics into our ocean, in three tracks: -New materials and chemistry to replace current fossil-fuel based plastics -Waste reduction, avoidance and recycling -Innovative product delivery systems Three winners will each receive a prize valued at US $40,000 comprised of $25,000 seed funding and a place at the 2019 Think Beyond Plastic accelerator, valued at $15,000. Winners will be invited to showcase at Think Beyond Plastic’s 5th annual Investor Forum. Applications are accepted now through April 30, 2019. 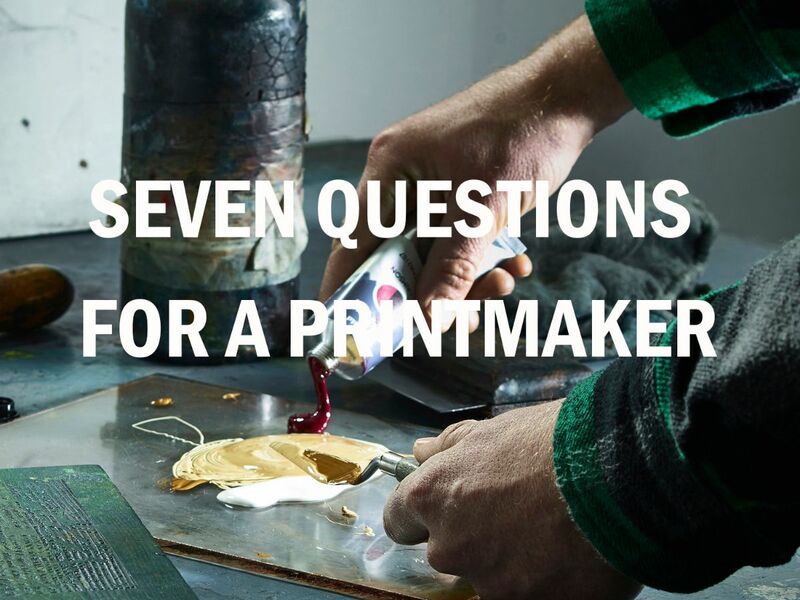 Welcome back printmakers and hello new subscribers – thank you for joining our global printmaking community! Make a print of any kind on 4th May 2019! Share your results on our blog www.printdayinmay.com and/or on our social media pages using #printdayinmay2019 We are a forum FOR YOU! 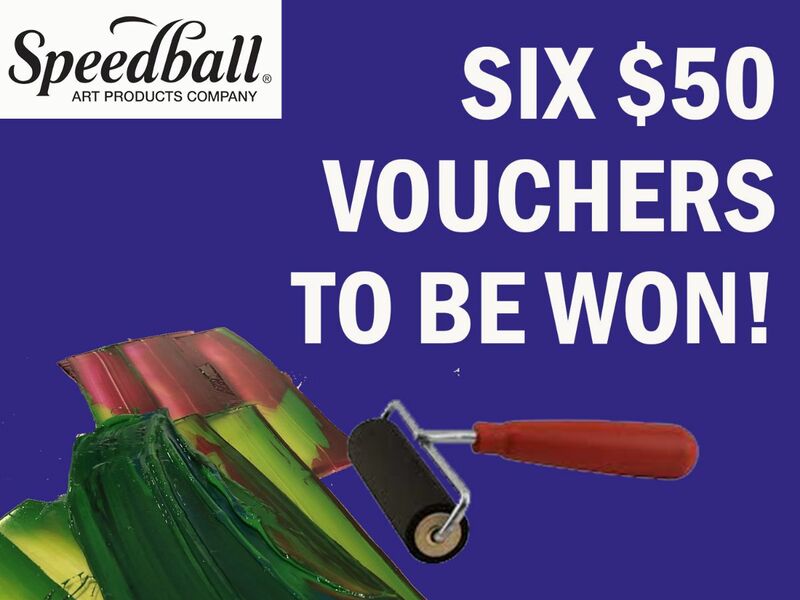 WIN A $50 VOUCHER FROM SPEEDBALL! Be in with a chance to win a range of free printmaking materials from Speedball, including Akua inks, tools and accessories and Arnhem 1618 printmaking paper! A total of six winners will receive a $50 voucher! Ryan Pierce, a co-director of Signal Fire will be visiting our campus. Signal Fire is a non-profit based in Portland, that provides opportunities for artists and creative agitators to engage with our remaining wildlands. He is going to give a slide presentation on their “Wide Open Studios” artist residency scheduled this summer. Wide Open Studios is Signal Fire’s arts and ecology field institute, making our innovative wilderness excursions available to college students, emerging artists, or anyone seeking an immersive, hands-on, and transformative arts education. These trips invite students to explore their studio practice in dynamic wilderness locations, amidst an atmosphere of friendship and critical thinking. Our curriculum is centered on the natural and cultural histories of the sites we visit, and the possibilities of making art in— and in response to— wild places. Individual and collaborative projects invite students to see the wild as a place of wonder, empowerment, action and connection. texture, ability, and gender. Monday, Feb. 25, noon–6:00 p.m., EMU, Crater Lake North, UO Eugene Campus. Coordinated by UO’s Center for Student Involvement, this annual festival showcases the works of the LGBTQIAA community’s actors, writers, and directors. The Hemisphere editorial committee seeks scholarly essays that present interdisciplinary research on the work of Latinx artists in the U.S. from any period starting in the 18th century through the present, from any region of the country, and in any form and medium. Hemisphere’s hope is to identify and feature new research based in creative approaches drawn from the increasingly overlapping fields of art history, visual and material culture studies, gender studies, queer studies, social activism and politics, and others. Read all about this opportunity and submit your work by Friday, March 8. Are you in the process of applying to MFA programs? Are you interested in having someone coming from a queer and/or POC perspective review your manuscript and personal statement…for free? MFA APP REVIEW is an all-volunteer initiative seeking to increase access to fully funded writing programs and to build community among underrepresented writers. This opportunity is offered remotely and will run through Monday, March 31. Project: Make 10 drawings for a simple children’s coloring book for Rural Honduras schools about the dangers of cooking over an open fire in households. Apply by email. ASAP (open now, Feb 19, 2019). No compensation but a great resume builder. We are pleased to announce that Contemporaneity: Historical Presence in Visual Culture is seeking artwork for its 8th edition. Art can be understood as a product of its Zeitgeist-a reflection of the time from which it comes. The temporal dimension of art has long been used by artists to understand their own position in time and to link themselves and their work both to the past and the present. The 8th issue of the journal Contemporaneity: Historical Presence in Visual Cultureseeks artistic submissions that address the relationship between artists and their time and ask what it means to be contemporary. Contemporaneity’s 8th edition, titled “Yesterday’s Contemporaneity,” uncovers how cultures throughout the global past have negotiated temporalities, modernities, and historicisms to come to terms with what it means to be present in their own moment. How can both history and modernity be visualized, contextualized, or conceptualized to create a sense of contemporaneity? How have institutions created temporalities for the cultures they study, and how can a historical object or space shape a person’s perception of an entire culture’s identity or agency? What is at stake in defining a work of art’s place in time? For the arts section of edition 8 Contemporaneityis seeking artworks engaged with these or other questions relevant to the negotiation of temporalities within one’s art practice. In particular, we welcome submissions concerning anachronisms, futurisms, revisionisms, as well as spoliation, re-use of the past, and appropriation. 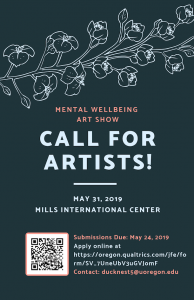 The deadline for submissions is April 30, 2019. Submissions should include the candidate’s full name, e-mail address and telephone number, a brief biography, an abstract about the artist’s work, 3-5 keywords, and a single PDF containing high-quality image(s) of each work to enable the selection committee to form as accurate an idea as possible of the applicant’s practice. There is no entry fee and no monetary publication reward. Applicants working exclusively in the medium of video are advised to provide a link to a video hosting site such as Vimeo or YouTube or to their own site where the video can be viewed. To make a submission, visit contemporaneity.pitt.edu, click Register and create an Author profile to get started. We recognize that submissions may take many forms. As such, proposals and questions can be directed to the editors at contemporaneityjournal@gmail.com. Contemporaneity: Historical Presence in Visual Culture is an open access journal organized by the History of Art and Architecture Department at the University of Pittsburgh. Visit contemporaneity.pitt.edu and constellations.pitt.edu for more information. ShelterCare is hosting its 9th annual Art Gives Hope fundraiser on April 25th, 2019. ShelterCare provides housing and behavioral health services to the most vulnerable of Eugene/Springfield’s homeless population. This year, we opened up our Call for Art to the public. 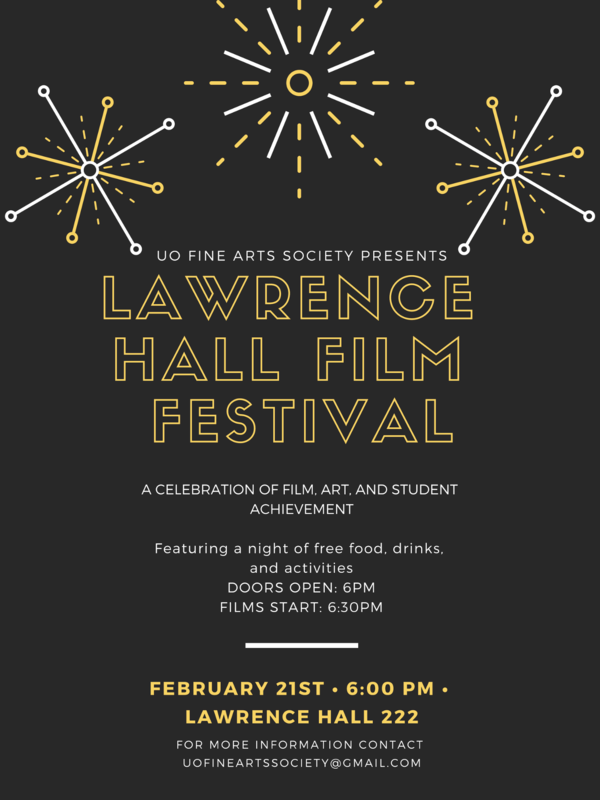 The Lawrence Hall Film Festival, presented by the UO Fine Arts Society will take place on February 21st, 2019 at 6pm in room 222 of Lawrence Hall. 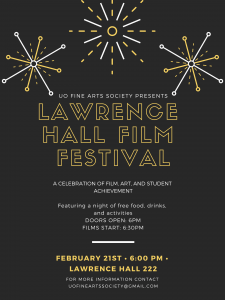 There will be free food and drink starting at 6pm and a film screening featuring entirely original student work begins at 6:30pm. My name is Jess Nani, and I’m the editor for Sink Hollow, an Undergraduate Literary Journal from Utah State University. We are currently accepting submissions for art, poetry, fiction, and nonfiction. The submission deadline for the spring 2019 issue is March 25th. More information and submission guidelines can be found at www.sinkhollow.org. The City of Eugene will be celebrating its first National Dance week, April 22-29 with a culminating event on Saturday, April 27 and something to share worldwide on International Dance Day on Monday, April 29. Our website is up! We have a Call to Artist and an application to Host a Dance Workshop or Activity. Both applications are due on February 25, 11:59pm. We are very excited to be working with the dance community and looking forward to the development of our very first citywide celebration of National Dance Week! Please help us spread the word and share in your newsletters and social media! The website includes links to both applications. This vibrant celebration for dance lovers of all age groups and experience levels will include free workshops, pop-up performances and activities. The call for entries for Fantoche International Animation Film Festival is open! You can still submit your film until 17th of May 2019. The “International Competition” will be open to films of all animation techniques, including a combination of live action and animation, lasting a maximum of forty minutes and having been completed after 31st of March 2018. For further information visit: https://fantoche.ch/en/news/call-entries-2019 or you can submit your Film directly via FilmFreeway (https://filmfreeway.com/Fantoche). The Maude Kerns Art Center is currently looking for experienced and creative Printmaking Instructors to teach adult classes in our newly opened Printmaking Studio! We are looking for classes in the following processes:Screen Printing, Relief Printing, Intaglio (Copper Etching Only) and a Printmaking Basics Class. Classes are typically 2 – 3 hours once a week, and run for a total of 8 weeks. This is for our Spring term which begins in April, times and dates are flexible due to the studio location. 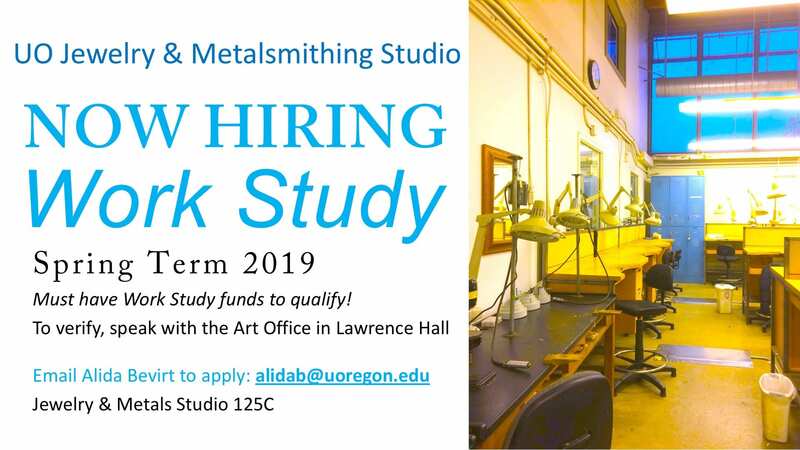 This is a great opportunity for professional artists, college students or grad students to gain experience in teaching or furthering their own creative careers, and to become part of Eugene’s long standing art center. If you are interested, please e-mail a resume, portfolio/website/examples of work, and cover letter to Jocelyn ateducation@mkartcenter.org, or drop them off at the Art Center at 1910 E. 15th Avenue. 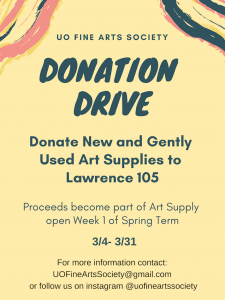 PlySpace is an artist-in-residence program located in Muncie, Indiana, that is funded in part by the National Endowment for the Arts. We are currently accepting applications for the FALL 2019 Term // Deadline: March 1@ 11:59 PM. PlySpace accepts applications from all creative disciplines including performance, fine art and crafts, writing, design, dance, and many more. For complete information about the application requirements, eligibility, funding, facilities, and amenities, please see the website at www.plyspace.org. I’m from Camp Weequahic, a private co-ed summer camp in Northeast Pennsylvania, and we’re looking for counselors to help lead our ceramics program this summer. This position is for someone who will love living in a bunk with campers, helping them gain confidence in the studio, and enjoy spending time with our other staff members, who are from all over the world. We welcome the opportunity to speak with any interested candidates. Our dates for this summer are June 19- August 12, and our first year counselors typically make $1500 salary plus a $300 travel stipend, along with room and board. Please check out our short video and our website at www.weequahic.com, where you can fill out our online application. For questions or if you have an interest, please feel free to call or email James, our staffing coordinator, at james@weequahic.com com or877.899.9695 or check our facebook page dedicated to our 2019 staff. My name is Mackenzie Fox and I am the Marketing Director at Lounge Lizard NYC. Lounge Lizard is offering a scholarship contest for the Spring Semester. The award includes a cash prize for the winning student. High School, Undergrad and Grad students are eligible. The deadline is in 3 weeks and we have only received 5 applications. Please feel free to email or call me directly at my number below.